That’s the verdict of Amazon Prime tennis analyst Robbie Koenig. Djokovic came through a tense third-round tie with Federico Delbonis on day five at Hard Rock Stadium, winning 7-5, 4-6, 6-1. The World No 1 was under real threat in Miami but overcame his struggles in a dominant third set to win in exactly two hours. Djokovic will now take on Robert Bautista Agut in the fourth round having downed Delbonis and before him, Bernard Tomic. Those matches have seen the Serbian face very different challenges but the six-time Miami champion has overcome both. And Koenig – himself a former pro on the ATP Tour – believes it will set Djokovic up well as he looks to surpass Andre Agassi and become the outright most successful man in the Masters 1000’s history with a seventh triumph. 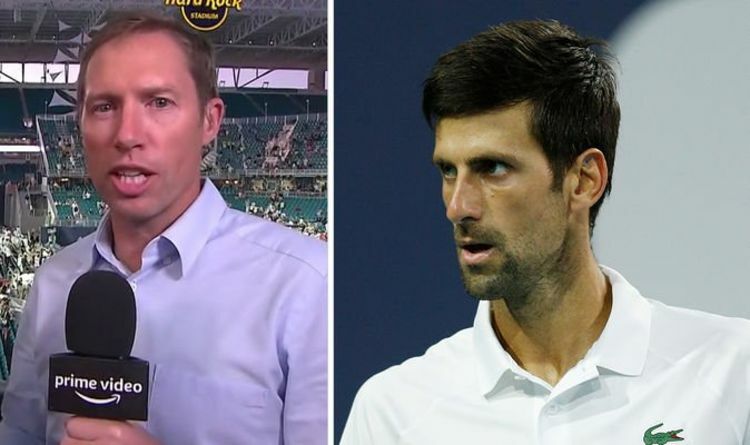 Analysing Djokovic’s win over Delbonis in south Florida, Koenig said: “One righty, one southpaw – he’s seen a bit of everything [in his first two matches]. “A good chance now to get familiar with the surface and how it’s playing. It’s very slow. “Me and Mark [Petchey] had a hit earlier and it’s very gritty. I think that’s going to play into Djokovic’s wheelhouse. “He can run all day as we know. After the scare that he’s had today, he’ll be good to go for the rest of the tournament. “These guys are the most susceptible early on in this tournament. But Koenig paid tribute to the effort of Argentine Delbonis, who gave Djokovic a real scare under the lights. The South African added: “You’ve got to give Delbonis plenty of credit, he kept bringing it, kept pushing the envelope. “To beat the very best player on the planet you’ve got to do that. “Of course, the key is doing it for a sustained period of time and that’s always the tough part. “Usually that’s when guys fall away against Novak but certainly not Delbonis. “Growing up on a clay court, he’s used to these long exchanges and long baseline rallies. He has the weaponry to hurt Djokovic and it was nice to see him bring it in the second set. “He cut down on the unforced errors in the second and the fact he had variety [in his shots] as well. “The early stages of the third were key. Against the best guys in the world, it’s all about your base level. A lot of guys can play well for one set against the likes of Djokovic and co.
Roger Federer had to overcome a battle of his own, coming from a set down to beat Radu Albot in his opening match. The Swiss icon is paired with Djokovic’s countryman Filip Krajinovic.